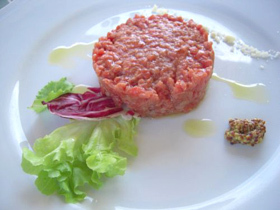 This recipe, known variously as Carpaccio all’albese, Carne alla Zingara (Gypsy style) or Carne cruda all’albese, didn’t originate in the Alba area, and is in fact an adaptation of a recipe that originates elsewhere. It is mentioned here because of the indubitable success and popularity that it has had in the past, and will certainly continue to have in the future. Several days in advance, infuse the ground pepper and clove in the olive oil. Stick the tines of a fork into a peeled clove of garlic that has been very lightly squashed, and use this to beat together the oil, the lemon juice, and a pinch salt. Pass both sides of the slices of meat in the emulsion, and arrange the slices on a serving dish. Leave 10-15 minutes and serve. In season, sprinkle slivers of truffle over the meat just before serving, and omit the lemon juice. Slivers of freshly grated Parmesan and/or slivers of mushrooms, can also be sprinkled over the meat, just before serving. In either case omit the lemon juice from the sauce. Wine Suggested: The raw meat is something very popular in the Alba region, like its variant of the knife cut meat. I would pair it with a young wine, like it’s usually is the Barbera, but We find better the gentle acidity and bitterness of the Grignolino. We are referring to a special Grignolino, the only one that comes form Barbaresco, produced by Susanna Bianco (Gigi Bianco estate) with love. In any case it could be nice to start with this dish directly with a Barbaresco, especially if you can slice on it some truffles of mushrooms. Then follow with other dishes with the same wine. Barbaresco Montestefano of Serafino Rivella 2004. Discover the land of Piedmont in Italy: its wines and magic, few itineraries oeno-gastronomic of great interest. Our company is located in Alessandria, Italy, in between Langhe, Roero and Monferrato, close to Alba and its region.